2.2 Which File To Download? The STEM Project published full-length video tutorials for STEM on YouTube in several languages. 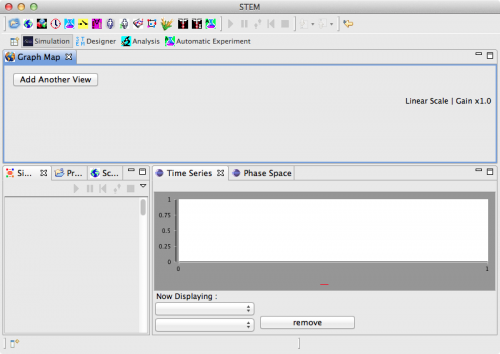 If you want to use STEM to compose models, scenarios, and run simulations, you can download and install STEM as a standalone application following the instructions in this guide. If you want to extend or add new functionality to STEM, including new disease and computational models, you need to build STEM from source. See the Setting up a STEM Development Environment page for more instructions. The STEM Project publishes several different binary versions of the application. Please consider these options when choosing which to download. Most modern operating systems from 2009 and on support 64-bit (x86_64) compiled binaries. The 64-bit version of STEM can take advantage of larger memory spaces (beyond 2 GB), which is necessary to run very large (global) simulations. The STEM project publishes both 32-bit (x86) and 64-bit (x86_64) versions of the application for each supported operating system. The version you download strictly depends on whether you have a 32-bit or 64-bit Java Runtime Environment (JRE) installed. If you have a 64-bit JRE installed, download the x86_64 version. Otherwise, download the x86 version. Some 64-bit JREs can run in 32-bit mode. Please see your JRE's documentation for instructions. The best version of STEM to download is generally the latest Release. In addition to being fully tested and stable, it's approved for distribution by the Eclipse Foundation and subject to the terms of the Eclipse Software User Agreement and the Eclipse Public License. However, power users or those looking for the latest features may choose to download the latest Weekly Integration, Milestone, or Release Candidate build. These builds may not be stable and are not sanctioned by the Eclipse Foundation. Use at your own risk. The STEM application is bundled as a platform-specific, zipped archive and does not contain an installer. To install STEM, download the appropriate bundle and unzip it to your desired installation path. The STEM installation path cannot contain whitespace characters. Ensure that the install path contains no spaces, tabs, etc. If you already have STEM 1.4 or newer installed and wish to upgrade, see the STEM Updates section. On the mirrors page, select a nearby mirror site. This will begin the download. If prompted, choose to Save the file. Note where the file is downloading to. On some systems, the browser may automatically execute (unzip) the file when it finishes downloading. If this is the case, skip to step 8 when the download finishes. Note: STEM is approximately 150 MB in size. Depending on your connection and mirror speeds, the download will take from a few minutes to an hour or more. Note: On most systems, double clicking the the .zip file will automatically extract it. 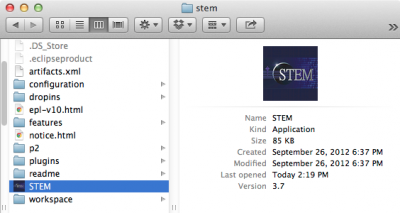 Extracting the archive should create a folder called stem. Move this folder to the path you wish to install STEM at. IMPORTANT REMINDER: Verify that the install path does not contain whitespace or non-ASCII characters, including spaces, tabs, etc. Increasing the system memory available to STEM. Some large scenarios (e.g. with thousands of nodes and edges), require that you make sure you allocate enough system memory for STEM. If you don't do this the application may hang or crash with a "Heap Space" error. To allocate enough memory in Windows, create a shortcut for launching STEM. You may place this anywhere (e.g., on your desktop or on the quicklaunch bar). On MAC OS X, using the finder, navigate to where the STEM application is located, right click and select "Show Package Content". Navigate to Contents->MacOS and open the STEM.ini file in an editor. Change the -Xms and the -Xmx lines to increase the memory, e.g. -Xms1024M -Xmx4096M or more depending on how much memory is available. That's it! STEM is now installed. See the next section for instructions to launch STEM. Mojave has new security control features that can make it challenging to install applications and get them to run. If you get an error launching STEM follow the instructions below. 3. Open "System Preferences", click on “Security & Privacy” and check under the General tab. 4. Unlock the settings by clicking on the padlock and entering your password. 5. Where it is written, “Allow apps downloaded from:” you will now see a third option: “Anywhere”. Select this and click on the padlock icon to save the changes. After STEM is unzipped and placed in the install folder, you can launch the application. STEM can run both with a full Graphical User Interface (GUI) or "headlessly" in a text-only console. For more information about the text-only option, see the headless STEM article. These tasks may take 1-2 minutes depending on system speed. During this time, only the splash screen is displayed. The first time you run STEM, the Welcome to STEM screen will display. You can close this by click the X on the Welcome tab. 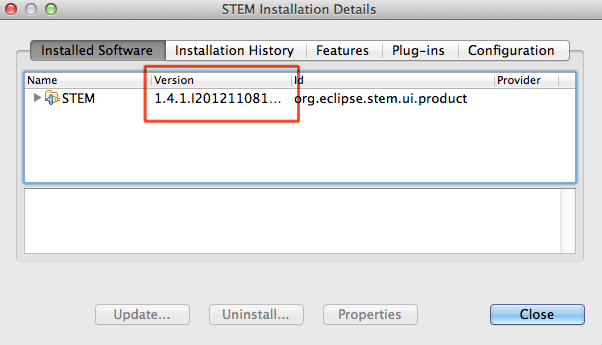 STEM uses the Automated Eclipse Updates to make it easier for users to install additional features to STEM. Today, one feature you may want to add is the Earth Science data plugin that contains global climate data for the years 2001-2010. This plugin is required, for example, if you want to use the Anopheles Mosquito model. See the main article for instructions on how to install new features into STEM. Starting with version 1.4, you can use the update mechanism built into STEM to perform upgrades without re-downloading the full installation bundle. Most of the time, this means you don't have to re-download the large denominator data sets packaged in STEM or have to export and import your scenarios. PLEASE NOTE. STEM V2.0.x and earlier are based on Eclipse 3.x The Latest versions of STEM beginning with STEM V 3.0.0M1 are base on Eclipse 4.x and therefore require that Java 8 be installed. Please see system requirements above. The following procedure will not update your Java installation. This must be done first. After updating STEM, the version displayed on the splash screen at startup may not change to reflect the new version. To verify STEM updated successfully, check the STEM Installation Details. 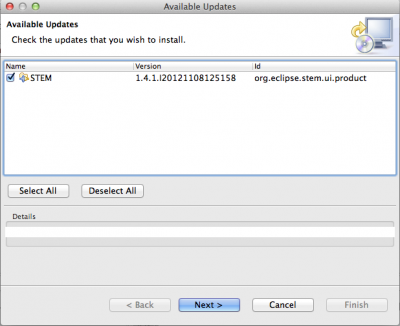 By default, the STEM update feature only checks for the latest, official release approved by the Eclipse Foundation. However, users will often want to take advantage of new features published in weekly integration and/or periodic milestone and release candidate builds. You can easily configure STEM to download and install these updates. If you might contribute to STEM development or if you want to always have the most recent code, then you will need to install Eclipse. This page was last modified 19:16, 8 February 2019 by James Kaufman. Based on work by Stefan Edlund, Judy Douglas and Matthew Davis and others.